Hi everyone. Today I'm sharing my first attempt of painting with Alcohol Inks. I hope to figure things out with more practice. For a first one, it's not bad. :) I learned today that it's better using less colours. I had originally added four layers of oranges and reds to the poppies, but the ink built up and became too thick. Less is more with AIs (alcohol inks). I ended up taking quite a bit of colour off with blending solution. Since making this card, I have seen a tutorial by Tim Holtz where he adds blending solution to the barrel of a water brush and then picks up dried Alcohol inks with the tip and paints. This seems like a much easier way to paint with AIs, so I will give that a try soon! For the card above, I started by dropping three shades of yellow / brown in the background. I added a squirt of blending solution and then used a folded up paper towel to move the colours around ... basically sponging the background. I let it dry and then gave it a couple of spritzes of blending solution from a mister bottle. As I mentioned in an earlier post. When working with alcohol inks, rubbing alcohol or blending solution, make sure to work in a well ventilated room and keep the sprays away from your face. Wear a face mask if you have one. Once my background was dry, I stamped my poppies in archival ink and then painted over top with orange and red alcohol inks. The archival ink stamps well on the dry background, but once you start adding AIs over top, it dissolves into the colour, making it similar to no-line colouring. I added a simple frame and stamped sentiment to finish the card. 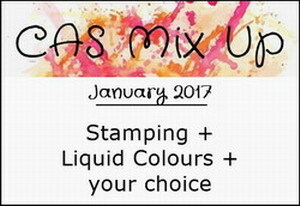 Going to add this card to the gallery at CAS Mix Up where the challenge this month is Liquid Colours. Check out the challenge HERE if you haven't had a chance yet ... lots of inspiring cards in the gallery. Well done Loll! Your painting turned out great. Don't leave any blending solution in a water brush or it will start eating the plastic away. Not sure what happens if you clean it after use (Tim didn't say). Stunning card and really useful details about how you did it. I love the vibrancy of colours that you get from alcohol inks. This is really pretty Loll. You are the Queen of new techniques. Love it. Love those vibrant colours - especially on a grey day like today. Looking forward to trying that technique. It must be very difficult technique, but you do not have things difficult :-) Wonderful card, I love the vibrant colors and the work of blending the liquid on the card. You are one, brave lady! This is fabulous and the colors are so rich and vibrant! What a wonderful, new technique! This is amazing and I'm a long way off from trying it. Wow Loll, I've used alcohol inks for backgrounds but never thought to paint with them! What a marvelous technique. Painting with alcohol inks? WOW Loll this is just amazing. This is just gorgeous, Loll! 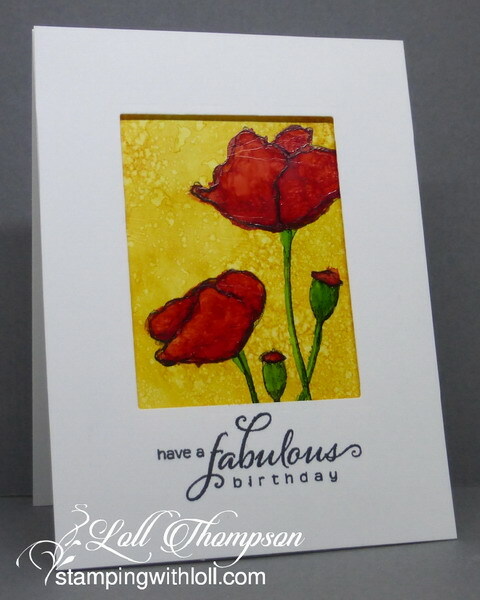 I love the red poppies on that bright yellow background! Another technique I'm anxious to try! I think it is pretty darned pretty, Loll! Love the vibrancy of the colors. This card is so cool. You are very good at trying new things, Loll. Ohhh what a stunner Loll - love how you experiment and then share the results, you are so brave. Oh, you are just the best when it comes to trying out new techniques, Loll!!!!! Your poppies look absolutely amazing and I really like the wonderful yellow bg!!!!! The fonts of the sentiment stamps are so lovely and it compliments your beautiful painted panel so perfectly!!!! I love the big, white frame!!!! STUNNING card!!!!! What stunning, rich colors! Thanks for sharing your experiments with new things...you are fearless (smiley face) and that is inspiring! Clever idea to put blending solution in barrel of water brush. Wonderful piece of art (and you call it "not so bad"...)! I admire your adventurous spirit and always trying out something new! Your poppies look gorgeous on that lovely sunny background, Loll. Another great technique to try! Wow Loll your Alcoholic Inks flowers are gorgeous. This looks fantastic to me, I can't see you had any trouble! I have just a couple of alcohol ink bottles but might fun to give them a go, I've been checking out the current CAS MixUp and thinking to enter but haven't really had the courage to get those ink bottles out yet! Maybe over the weekend, let's see! Fantastic card! Fantastic job! I was thinking of getting my Yupo out again. Today I watched a few tutorials about watercolouring on Yupo and I remembered how addictive it is to use alcohol inks as well! Love those PB blooms...need to try that "painting" technique! Lovely card!